It has been now almost 2 years since the South Korean immigration denied Maitreya RAEL the right to enter Korea where he was invited to give a conference by the hundreds of raelians in that country. 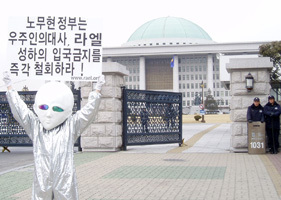 Since then, the Korean raelians have been asking for the decision to be revised but without success so far. The same terrible refusal occurred a few years ago, in South Korea as well, for the Dalai Lama, denying Korean Buddhists the right to welcome their spiritual leader.